'Buckyballs' Solve Century-Old Mystery About Interstellar Space : The Two-Way Scientists have long wondered what's in the wispy cloud of gas floating in the space between the stars, absorbing starlight. Turns out it's a form of carbon named after architect Buckminster Fuller. Harry Kroto, pictured in 1996, displays a model of the geodesic-shaped carbon molecules that he helped discover. Researchers in Switzerland say they've solved a nearly 100-year-old astronomical mystery by discovering what's in the wispy cloud of gas that floats in the space between the stars. Astronomers have known since 1922 that there was some invisible substance in between the stars. That's the year a young astronomy graduate student named Mary Lea Heger (who later became Mary Lea Shane) reported that something was absorbing specific frequencies of light coming from distant stars. Figuring out what that something was, though, hasn't been easy. "Many, I don't know, hundreds of papers have been written about this puzzle since 1922," says chemist Harry Kroto of Florida State University, who has written a few of those papers himself. In 1985, Kroto and some other scientists discovered a totally new form of carbon made up of 60 carbon atoms. These molecules are called "buckyballs," because they resemble the geodesic domes that architect Buckminster Fuller was designing in the 1960s. He argued that the buckyballs might explain the space puzzle. "I realized that it would be very stable in the interstellar medium, much more stable than anything else because it can survive the radiation field which is quite high," Kroto says. 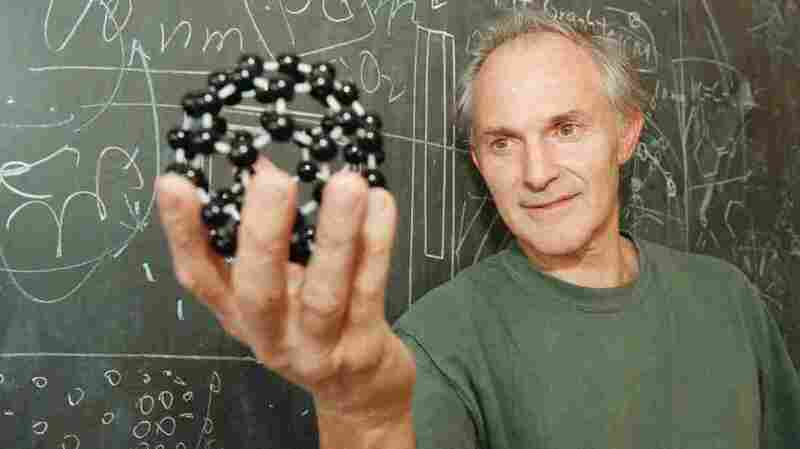 Kroto shared the Nobel Prize in 1996 for discovering the buckyballs. To prove buckyballs are the stuff in interstellar space, you'd want to see if they absorb light in a lab in the same way they do in space. But you'd need a lab set up that mimicked the space environment. "Friend of mine, John Maier in Basel, and his group, have been developing techniques to try to simulate these conditions in the laboratory," Kroto says. "Now this is not easy. This is low pressure, and very low temperature." Twenty years ago, Maier says, his lab at the University of Basel created a pretty good simulation of interstellar conditions. When they did that, a form of buckyball known as C60+ appeared to absorb light at just the right frequencies. But Maier wasn't satisfied with the setup, and neither were critics, who weren't convinced that C60+ really was the stuff floating around interstellar space. So he spent the past two decades making the lab conditions more spacelike. As he reports in the journal Nature, he's now satisfied. So apparently, are the critics. Maier thinks there will be more to the buckyballs-in-space story. He thinks they may be part of the explanation for how new stars form. "Probably these buckyballs are being formed as stars burn out, and perhaps get spat into interstellar space, and ultimately it's all recycled back into the formation of new stars," Maier says. For his part, Kroto is absolutely thrilled that his 30-year-old prediction about finding C60 buckyballs in interstellar space has proved true. "It looks as though C60 is all over the place," Kroto says. "And the incredible thing is it took us 'til the end of the 20th century, 1985, to find this thing. But it was basically detected in space in 1922, and that is just incredible."